The Bornean orangutan is found in the rainforest on the islands of Borneo. The Bornean orangutan and the Sumatran orangutan are the only two ape species found on the Asian continent. It is a large ape with long, red hair and long arms. Adults can grow up to five feet tall. Males are twice as large as females, weighing up to 220 lbs, and females weigh only up to 110 lbs. When fully grown, their arms can reach up to eight feet, enabling them to move through the trees with ease. Although their arms are long and strong, their legs and feet are short and weak. Males have cheek pads made up of fat, and they continue to grow as they get older. 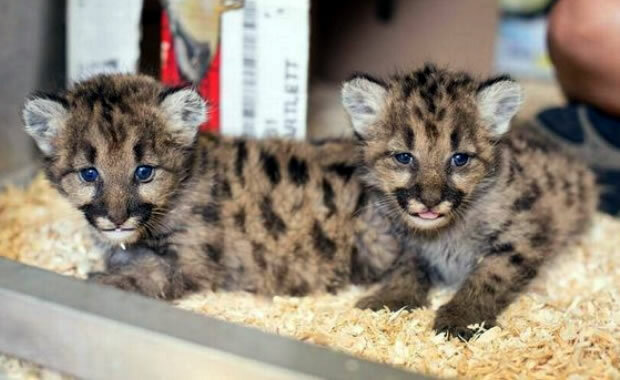 Since their cheeks are much larger than females, males are able to make louder, roaring noises. Orangutans also have large brains and are very intelligent. They are known to use small twigs as tools to obtain and hold food while moving through the trees. Orangutans are found in humid jungles, and much of their time is spent in the trees. At night they build nests high up in the trees and some even include a roof. Adults prefer to live alone and will only come together to mate. Females may occasionally group in twos. Males prefer to avoid confrontation or moving into territories of other males, so they make loud calls to keep track of the whereabouts of others. They can eat a large amount of food each day, feeding mainly on fruits such as mangoes, figs, jackfruits, lychees, durians, and rambutans. They will occasionally eat insects, leaves, tree bark, and eggs and small vertebrates. Mating occurs year round, and females give birth to only one young after a gestation period of 260 to 270 days. Bornean orangutans are classified as highly endangered (population 50,000). Causes of decline include loss of habitat due to logging, mining, and forest fires and poaching. Many babies are often caught and sold into the pet trade, and the trappers usually kill the mother in order to steal the baby. Although this species is legally protected, poaching still remains a problem. The orangutan is found in several national parks, and the governments of Singapore and Hong Kong have prohibited the import and export of orangutans. Copyright Notice: This article is licensed under the GNU Free Documentation License. 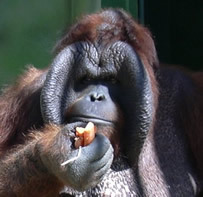 It uses material from the Wikipedia article "Bornean orangutan". Glenn, C. R. 2006. "Earth's Endangered Creatures - Bornean Orangutan Facts" (Online). Accessed 4/18/2019 at http://earthsendangered.com/profile.asp?sp=305&ID=3. Need more Bornean Orangutan facts?